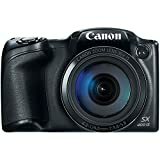 Amazon has the canon powershot SX400 digital camera with 30x optical zoom (black) for $122 with free shipping. Sells for $149+ Highest Price. Deals for $99 Lowest Price. Normally $129+.